Rabbits are a familiar symbol of the Easter holiday, and many people consider adding a rabbit to their family this time of year. As gifts, plush or chocolate rabbits are much better choices, both at Easter and other times. Here are several myths about rabbits to consider this holiday season. Myth #1: Rabbits make good pets in homes with young children. Truth #1: As cute and cuddly as they look, rabbits are easily injured with improper handling or by being dropped. With bone comprising only 10 percent of their body weight, they are much more fragile than a cat, for instance, in which bone comprises about 18 percent of its weight. As prey animals, rabbits generally prefer to keep all four feet on the ground. When they are picked up, they may bite or kick trying to get away. Personalities vary, and some rabbits can be easily frightened by loud noises (such as a child’s squeal or scream) and sudden, rapid movements. So, a rabbit's individual personality should be a consideration in finding the right match for your home. Myth #2: Rabbits are short-term, inexpensive “starter” pets. Truth #2: Rabbits can live 10 to 14 years, as long as some cats or dogs. They require specialized veterinary care by a trained, experienced “exotics” veterinarian, which can be costly. Rabbits should be spayed or neutered for both health and behavioral reasons, a procedure that can cost $300 or more. Myth #3: Pelleted food sold at the pet store makes up the majority of rabbits’ diets. Truth #3: Commercial rabbit pellets sold at pet stores should make up only a small portion of the rabbit’s food; this food will vary a bit depending on the rabbit's age. It should be made from high quality timothy hay for adult rabbits and it should never include nuts, dried fruit or seeds. Alfalfa hay based pellets are needed for baby rabbits and nursing mothers only. Rabbits require a large portion of grass hay and a smaller portion of fresh leafy green vegetables daily. Daily fresh vegetables can be grown at home, as long as it is done without pesticides. Pieces of carrot and fruit should be given as occasional treats only. It is dangerous to give rabbits “people food” such as popcorn, crackers or bread. Myth #4: “Dwarf” rabbits sold at Easter will not grow larger. Truth #4: Many rabbits sold at Easter are babies. If only a few weeks old, they may not be old enough to be fully weaned, which can lead to health issues later in life. Some people may believe they are buying a dwarf rabbit at Easter and then are surprised when the rabbit grows to be four to five pounds or more. Myth #5. Domestic rabbits can safely “roam free” outdoors. Truth #5: Domestic rabbits do not have survival skills like wild cottontail rabbits. Releasing them outside is an inhumane death sentence. They are likely to be killed by a dog, cat, fox, or hawk, or run over by a car. There are also parasites such as fleas, mites and bot flies that can result in disease or death of the rabbit. 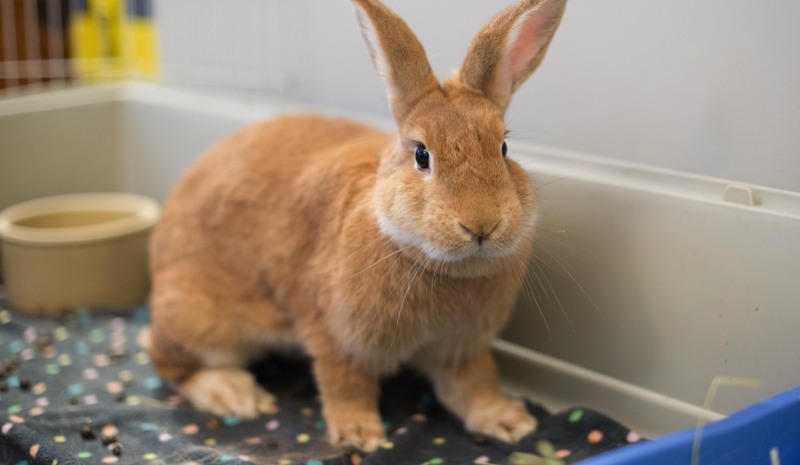 Before bringing a rabbit into your home, consider if a rabbit is a good match for your home and if you are willing to make the long-term commitment required to care for him or her. If you decide that a rabbit is right for you, contact a local rescue group about adoptable rabbits in your area. If you aren't sure, fostering a rabbit can be a great way to see if a rabbit is a good match for your family. Information about fostering rabbits for Triangle Rabbits or the SPCA of Wake County may be found at https://www.trianglerabbits.org/volunteer/foster.html. Columbus House Rabbit Society. "Make Mine Chocolate." http://www.makeminechocolate.org/. Rosenthal, Cathy M. "Don't get a rabbit just because it's Easter." Chicago Tribune. April 14, 2017. https://www.chicagotribune.com/lifestyles/pets/ct-don-t-get-a-rabbit-just-because-it-s-easter-20170414-story.html. Daly, Natasha. "Here's why Easter is bad for bunnies." National Geographic. April 12, 2017. https://news.nationalgeographic.com/2017/04/rabbits-easter-animal-welfare-pets-rescue-bunnies/.